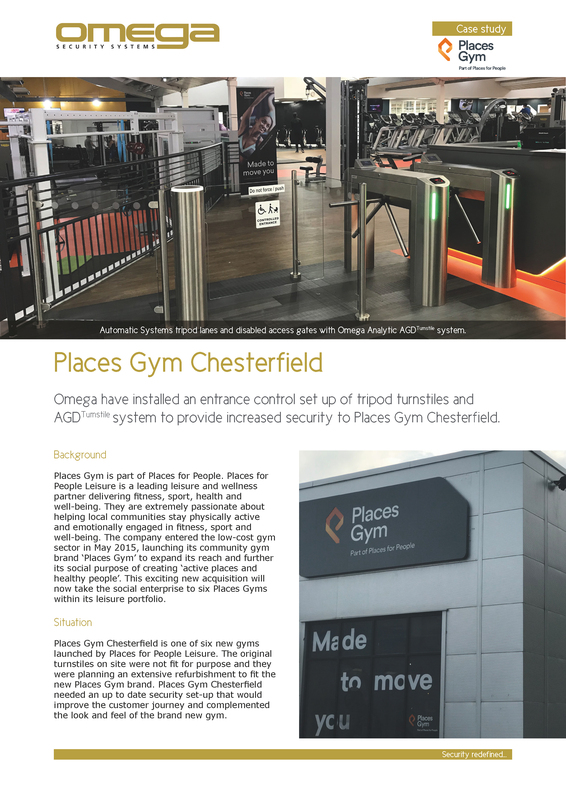 Omega have installed anentrance control set-up of tripod turnstiles and AGDTurnstile System to provide increased security to Places Gym Chesterfield. 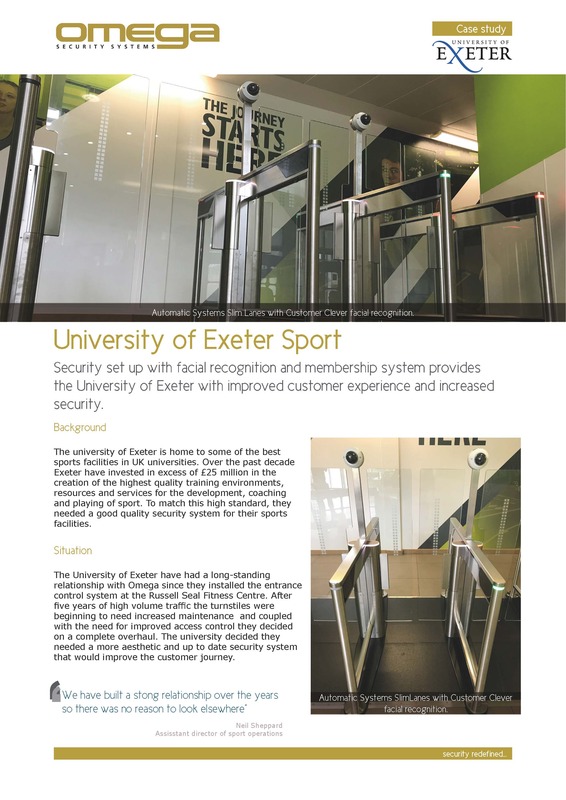 Security set up with facial recognition and membership system provides the University of Exeter Sport with improved customer experience and increased security. 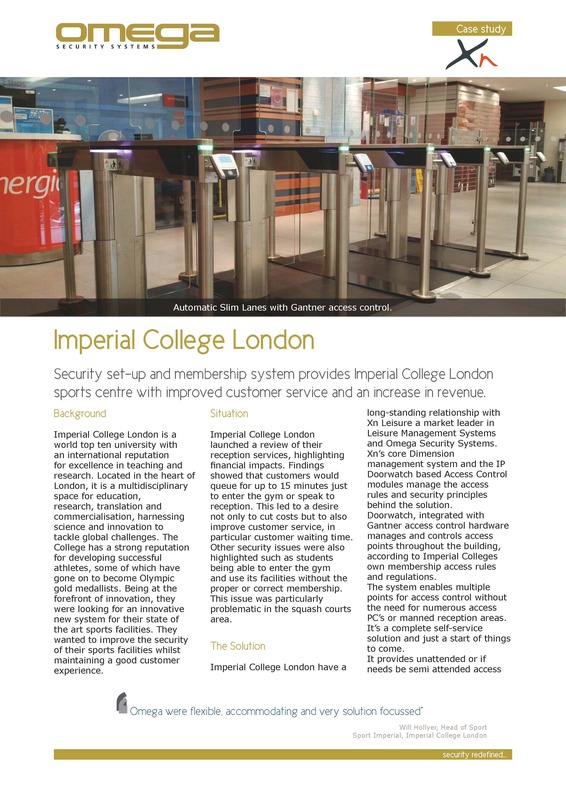 Security set-up and membership system provides Imperial College London sports centre with improved customer service and an increase in revenue. 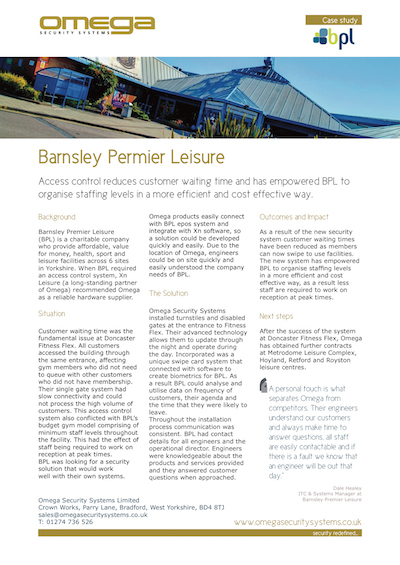 Access control reduces customer waiting time and has empowered BPL to organise staffing levels in a more efficient and cost effective way. 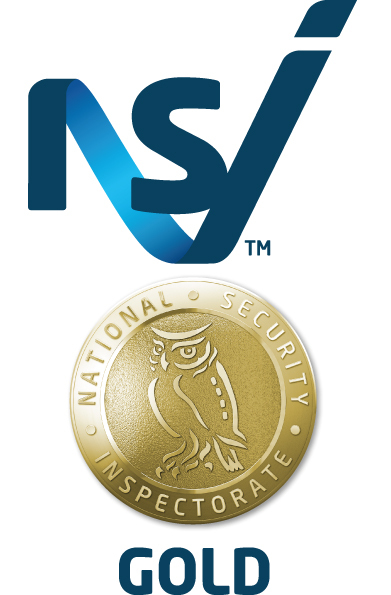 An integrated IP based security system provides site-wide security and reduces costs. 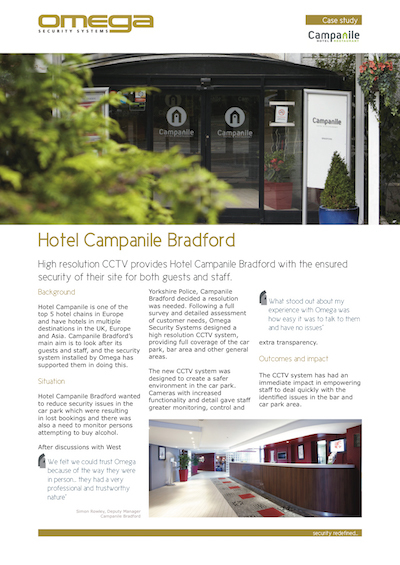 High resolution CCTV provides Hotel Campanile Bradford with the ensured security of their site for both guests and staff. 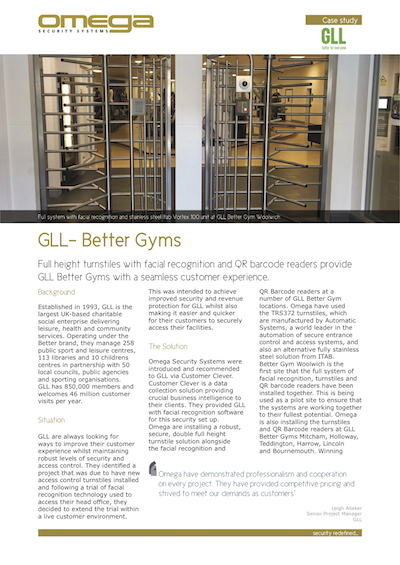 Full height turnstiles with facial recognition and QR barcode readers provide GLL Better Gyms with a seamless customer experience. "The team from start to finish were everything we expected and more.  Their professionalism and courtesy were a credit to the Company."  "There have been many occasions when we've urgently needed Omega's help and they responded quickly to resolve our fault...  They are a company with reliable and friendly staff." "A personal touch is what separates Omega from competitors. Their engineers understand our customers and always make time to answer questions, all staff are easily contactable and if there is a fault we know that an engineer will be out that day." "Omega has been a key partner of Xn Leisure for a number of years and has grown with us, offering solutions in the leisure and education market space.  They are ethical and transparent in their business dealing and have become friendly faces within our user customer base, supporting a number of our events." 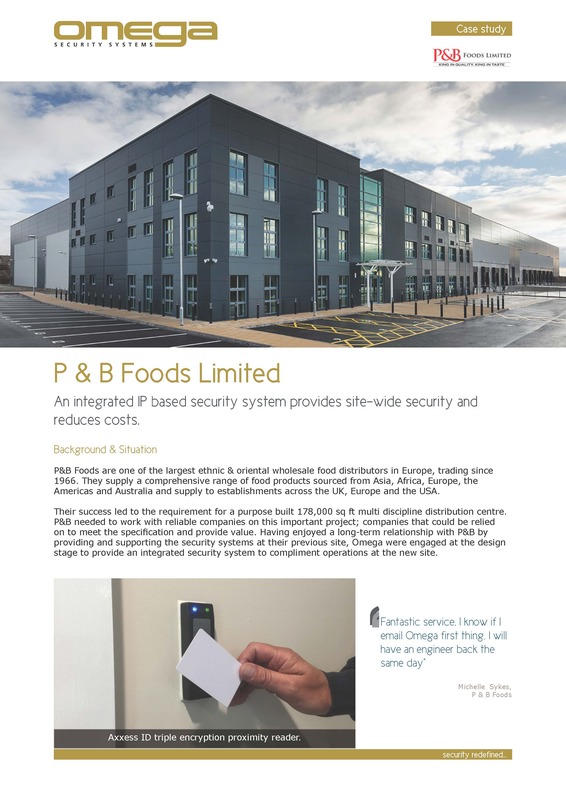 "Thank you to the guys at Omega for the highly professional job they’ve done in installing state of the art security equipment throughout our new 200,000sqft facility.  Their advice and experience aided us greatly in our final decisions-making and once we agreed to proceed with Omega, they carried out all installation procedures without causing any disruption to our own operations. A job well done by a very professional team." "I thought it would be a grand gesture to inform you of how well your team conducted themselves on my site here at Bedale. Each and every one of them got involved in every task, along with being the best team I have ever had the pleasure of working with in regard to team building activities. It is clear to me you have a very close knit and professional team.  They are a credit to your company and an absolute pleasure to have had here at aerial extreme. I do hope their visit was everything they hoped it would be as I would love to see the team again in the future."